The game of darts is such a simple game… yet it continues to draw in more and more players worldwide. 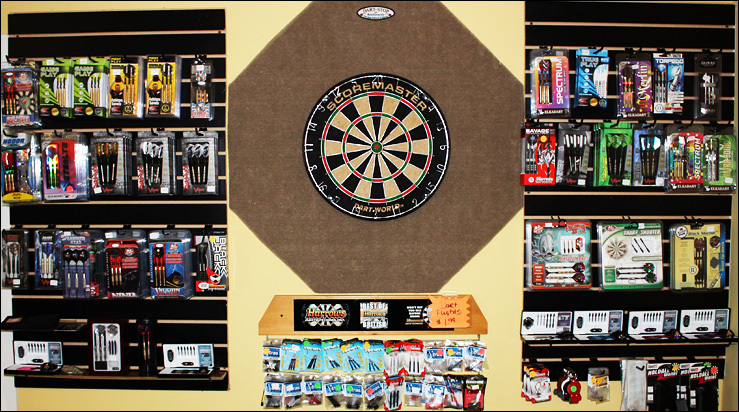 Perfect for game rooms, bar rooms and “man caves,” dart boards are a guaranteed hit! With over 100 different styles of dart boards and dart accessories, you’ll hit the bullseye with respect to C.P. Dean’s dart experience and products! Both seasoned dart players and “weekend warriors” alike appreciate the huge selection of dart boards, dart board cabinets, backboards, dart flights, and dart shafts we carry in house, right here in Richmond. Long and short….we know darts! We’re happy to explain the differences between dart flights, styles of darts, options for dart board cabinets and more. From Hammerheads made in America to Harrow’s of England, you’ll find a complete range of top brand darts at competitive pricing! If you have any questions about what kind of dart board, darts or dart accessories you’ll enjoy the most, please call us at (804) 355-6588 or contact C.P. Dean online! We have the knowledge, products and vast experience with darts to get you in the game!